Finding an example of a shipping container drawing is fairly easy. There are associations, architects and developers in this field who have produced them. In time we will have a section on this site for container home drawings, including shipping container cad drawings that visitors can use as models. The official name of shipping containers when used as buildings is Intermodal Steel Building Units (ISBU). 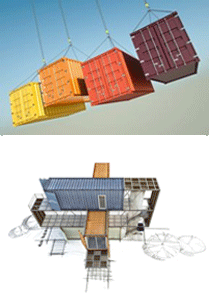 There is an ISBU association which has expansive information on shipping container buildings. It acts as an oversight organization for many of the designers and builders in the field and offers information to the public about this subject. Check out the site at isbu-info.org. One section of the site is devoted to a shipping container drawing collection . Exact architectural plans for the 20 foot and 40 foot ISO standard containers are available at the ISBU site for $28 per set. These plans can be used as the starting points for your building project. SG Blocks, sgblocks.com. The S and G stand for Safe and Green. They engineer their product for coastal areas so that they are safe for the kinds of inclemency found along the coasts. The green means that using containers cuts the carbon footprint in a building project by as much as 40%. This company, which practices architecture all over the U.S. in partnership with many other companies and organizations, offers many examples at its site. They offer many unique shipping container drawing models that, once built, would not appear to be built from shipping containers. Adam Kalkin, quik-build.com. The site includes shipping container drawing samples for a prefabricated kit house that Kalkin has designed. The standard plan is for a 3 bedroom, 2 ½ bath 2000 square foot home that can be assembled on site within one day. Together with finishing work the project should take three months or less to complete. It is made from 6 modified shipping containers. Peter DeMaria, demariadesign.com. This company builds upscale shipping container homes in Southern California. This group can provide your project with the plans necessary to build your designer home. Urban Space Management, urbanspacemanagement.com, builds multi-family communities in the London, England area from multiple shipping containers. Their Container City is a mixed-use environment of condominiums, artist studios, small business offices, youth center, and medical clinic made completely from shipping containers. Another good place to source ideas for your shipping container home, office or storage facility, is to check out videos at YouTube using keywords such as “shipping container buildings” or “shipping container architecture.” You’ll find many great ideas.